I started teaching at GCC in 2001, and while I am a graphic design teacher, I have always had an interest in history. So driving past "Matt O. Hanhila" stadium all of the time got me to wondering, "who is Matt O. Hanhila?" Luckily, since I worked there, I figured that someone would know. No one did. I could find no information anywhere on campus. I even searched on the web for years, to no avail. Sure, there was the Matt O. Hanhila Awards, etc., but nothing about the man. I've always been curious about the names of things. And I know that most people aren't. And if the stadium had been named the Memorial stadium, or something, I would have let it go. But Matt O. Hanhila was definitely a name. And the more I searched, the more I found people who asked me, "who cares?" As a scholar, educator, coach, official, and administrator, Matt O.Hanhila served a total of 58 years in Arizona’s public school system. As a member and past president of Phoenix 100 and Kingman Rotary, as well as a longtime member of the Glendale club, Hanhila also served as a lifelong Rotarian. Hanhila was born September 28, 1909 in Alaharma, Finland. He came to America in 1913 with his mother to join his father who was a copper miner in Bisbee, Arizona with no knowledge of English. He received a B.A. in Education from Arizona State Teachers College, now known as Northern Arizona University in 1932. Hanhila completed his M.A. degree in Education at the University of Arizona in 1939. In 1961 he received an Ed. D. in Administration and Supervision from Arizona State University. He was very proud to have degrees from all three universities of Arizona. Hanhila began his career as a professional educator in the Mojave County Union High School System in 1932. He taught math, physics, industrial arts, p.e. and coached all four major sports through 1953. Matt, also called “Hanny” by his athletes also served superintendent of the district for five years. In 1953 he began a decade of service with the Phoenix Union High School District where he was selected as the first principal of South Mountain (1953-1957) and Carl Hayden High Schools (1957-1963). From 1963 through 1965, Hanhila served as superintendent of the Paradise Valle Unified School District. In 1963 1965 he began his 12-year tenure with the Maricopa County Community College District. 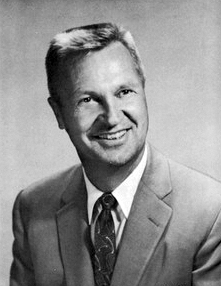 There he served as Assistant Dean at Glendale Community College from 1965 to 1967 and as Executive Dean (President) from 1967 to 1975. Hanhila retired in 1975 at which time the Football Stadium at Glendale Community College was named in his honor. Matt Hanhila continued to teach math part-time for 14 years. Throughout his career, Hanhila was an active member in a number of organizations including the National and Education Associations, Arizona State High Schools Principals Association and the Arizona State Public Schools Administrators Association. He was also a member and past president of the Arizona Blue Cross Corporation and was the first Chairman of the Board of Blue Cross/Blue Shield of Arizona. Hanhila coached high school sports in Kingman for 15 years. He also officiated college basketball for five years, college football for 22 years and various high school sports for 25 years. He was a past president of the Arizona State High School Coaches Association and was later inducted into the association’s Hall of Fame. He was deeply honored by having the Glendale Community College football stadium named the Matt O. Hanhila Field. Matt Hanhila was married to Merna Ellis Hanhila (who preceded him in death in 1990), a second generation Arizona Native, and together they had four children: Elissa Vergie Hanhila, Sigrid Merna Lynne Hanhila, Matt O. Hanhila, Jr., and Laina Lea Hanhila. Matt, Jr. is an Orthodontist, while all of the girls have taught school for a combined total of 109 years. 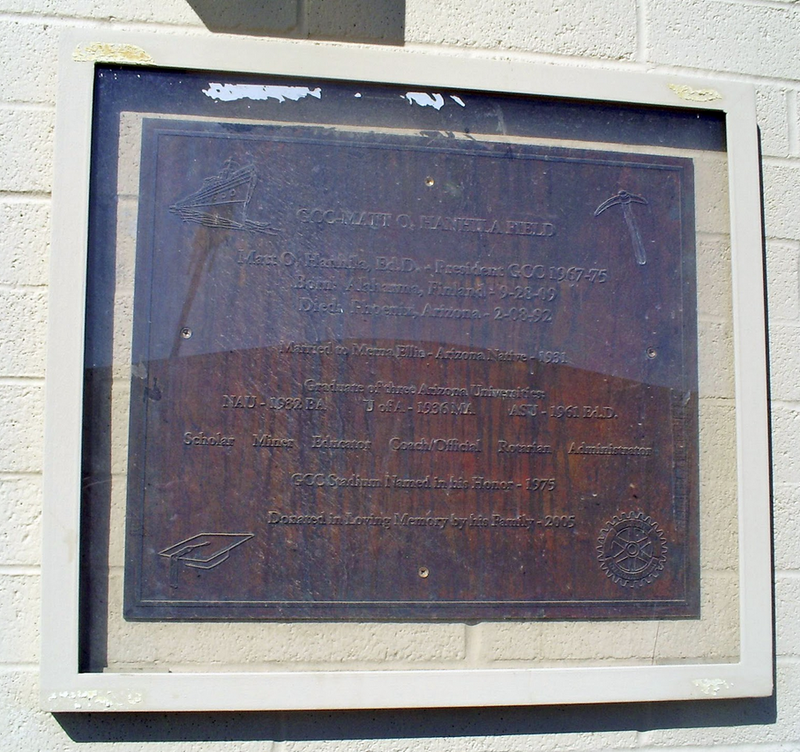 In 2005, commemorating the 40th year anniversary of Glendale Community College, his adult children had a a plaque placed in the Matt O. Hanhila Field Stadium detailing highlights of his life. He died on February 8, 1992 with injuries following an auto pedestrian accident in front of his Phoenix home. • 1945 - Matt Hanhila, Kingman coach, said Roy Campbell was one of the best halfbacks he had ever seen on an Arizona high school team. • In Patterson's American Education Volumes 56-61 (published in 1957), Matt O. Hanhila is listed as the principal of Carl Hayden High School. And yes, there is a plaque at the stadium, you just have to look for it. Go Gauchos! 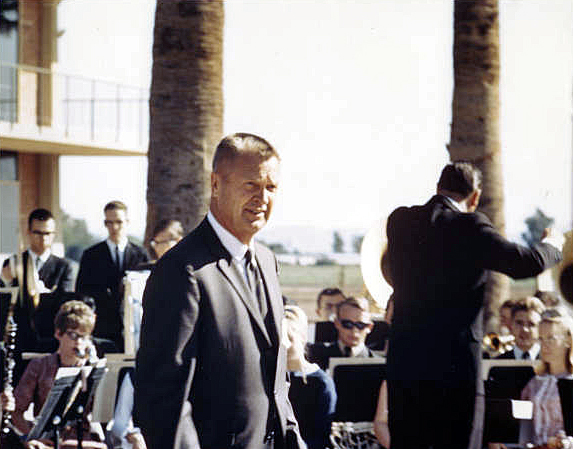 Image at the top of this post: Matt O. Hanhila at the dedication of the brand new Glendale Community College in 1966. You did a great job detailing my Grandpa's life. He was an amazing man and I still miss him. Hi Gabriel - looks like we worked there at the same time. This research took me many years to find out anything at all, and it wasn't until I wrote a post about it that I started getting some information. Thanks for your kind words! Go Gauchos!